The great state of Colorado is the perfect setting for so many different types of events or gatherings, but Colorado and weddings are truly a match made in heaven. Whether you and your partner are planning a wedding on the top of a mountain overlooking green valleys below or maybe you prefer to be nestled in a thick pine tree forest next to a trickling creek, Benson Tent Rent is the best choice for providing the equipment needed for the perfect party. 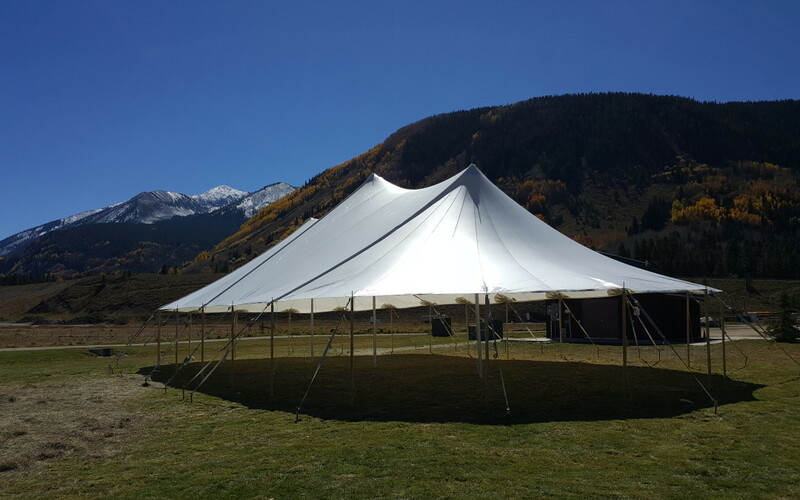 Our sailcloth pole tents fit in seamlessly with the mountain landscapes throughout the Rockies as they come standard with taller side-poles and valance-less tent tops. 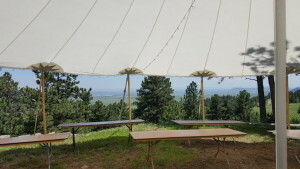 By not having a valance hanging down 6-10 inches from the tent top, your guests will be able to more easily capture the beautiful CO mountain views with no obstructions. The taller side-poles also contribute to a more open view while looking out from inside the tent and allow a guest sitting at a table to see more of a vertical view of the landscape by 10-20%. Our sailcloth pole tent also has clear-sidewalls as an option if you are wanting more protection from the elements but do not want sacrifice the ability to see outside of the tent. 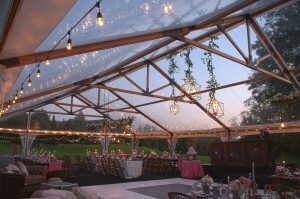 Another popular tent type for a tented Colorado outdoor wedding is our Timbertrac frame tent. 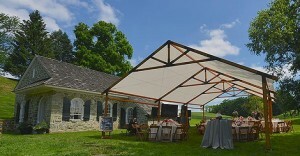 While this frame tent resembles a rustic, wood-beamed barn, it gives our clients to ability to have an elegant structure for their wedding set up at the location of their choice. Since this tent is a frame tent, it allows more flexibility for table /chair layout since it does not have any center poles. The Timbertrac frame tent is a versatile tent. It has two tent top options: clear top (great for those wanting a view of the moon and stars at night), and sailcloth top (offers more shade during the day and glows at night). 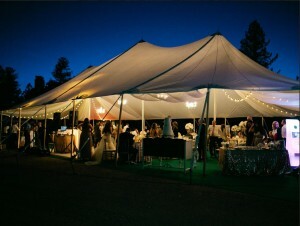 Contact Benson Tent Rent today to reserve your mountain style tent for your tented Colorado outdoor wedding!